In the Long Term Evolution (LTE) of UMTS the Interactive Mobile TV scenario is expected to be a popular service. By using multiresolution with hierarchical modulations this service is expected to be broadcasted to larger groups achieving significant reduction in power transmission or increasing the average throughput. Interactivity in the uplink direction will not be affected by multiresolution in the downlink channels, since it will be supported by dedicated uplink channels. The presence of interactivity will allow for a certain amount of link quality feedback for groups or individuals. As a result, an optimization of the achieved throughput will be possible. 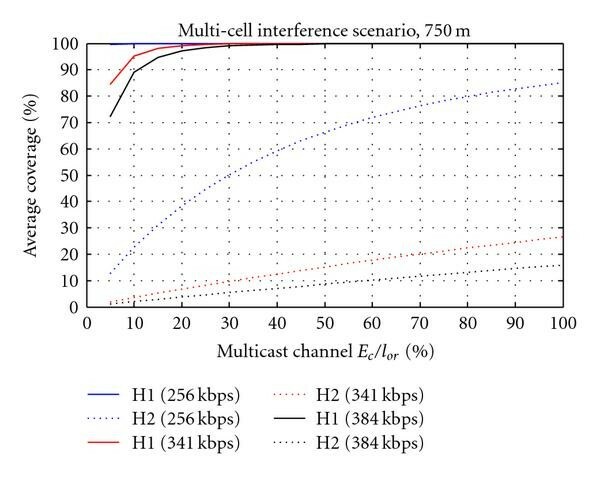 In this paper system level simulations of multi-cellular networks considering broadcast/multicast transmissions using the OFDM/OFDMA based LTE technology are presented to evaluate the capacity, in terms of number of TV channels with given bit rates or total spectral efficiency and coverage. 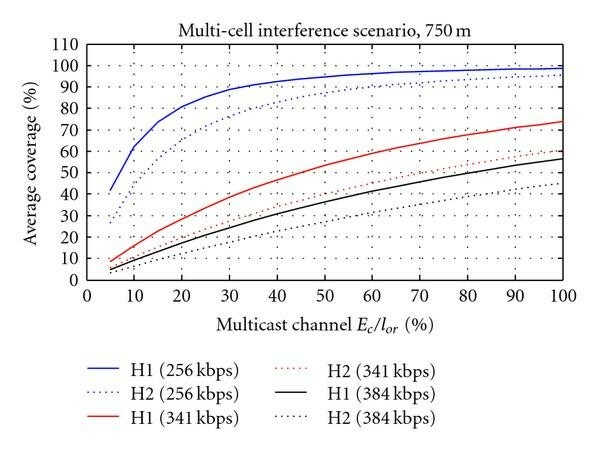 multiresolution with hierarchical modulations is presented to evaluate the achievable throughput gain compared to single resolution systems of Multimedia Broadcast/Multicast Service (MBMS) standardised in Release 6. Third-generation (3G) wireless systems, based on wideband code-division multiple access (WCDMA) radio access technology, are now being deployed on a broad scale all over the world. However, user and operator requirements and expectations are continuously evolving, and competing radio access technologies are emerging. Thus it was important for 3GPP to start considering the next steps in 3G evolution, in order to ensure 3G competitiveness in a 10-year perspective and beyond. As a consequence, 3GPP has launched the study item evolved UTRA and UTRAN, the aim of which was to study means to achieve further substantial leaps in terms of service provisioning and cost reduction. The overall target of this long-term evolution (LTE) of 3G was to arrive at an evolved radio access technology that can provide service performance on a parity with current fixed line access. As it is generally assumed that there will be a convergence towards the use of Internet Protocol (IP)-based protocols (i.e., all services in the future will be carried on top of IP), the focus of this evolution was on enhancements for packet-based services. 3GPP aimed to conclude the evolved 3G radio access technology in 2008, with subsequent initial deployment in the 2009-2010 time frame. At this point it is important to emphasize that this evolved RAN is an evolution of the current 3G networks, building on already made investments. 3GPP community has been working on LTE and various contributions were made to implement MBMS in LTE . Orthogonal frequency division multiplexing/orthogonal frequency division multiple access OFDM/OFDMA [2–4], used in the physical layer (downlink connection) of LTE, is an attractive choice to meet requirements for high data rates, with correspondingly large transmission bandwidths and flexible spectrum allocation. OFDM also allows for a smooth migration from earlier radio access technologies and is known for high performance in frequency-selective channels. It further enables frequency-domain adaptation, provides benefits in broadcast scenarios, and is well suited for multiple-input multiple-output (MIMO) processing. The possibility to operate in vastly different spectrum allocations is essential. Different bandwidths are realized by varying the number of subcarriers used for transmission, while the subcarrier spacing remains unchanged. In this way operation in spectrum allocations of 1.4, 3, 5, 10, 15, and 20 MHz can be supported. For MBMS support within a certain cell coverage area for a given coverage target, the (Modulation and Coding Scheme) MCS of the MBMS transport channel typically has to be designed under worst-case assumptions. 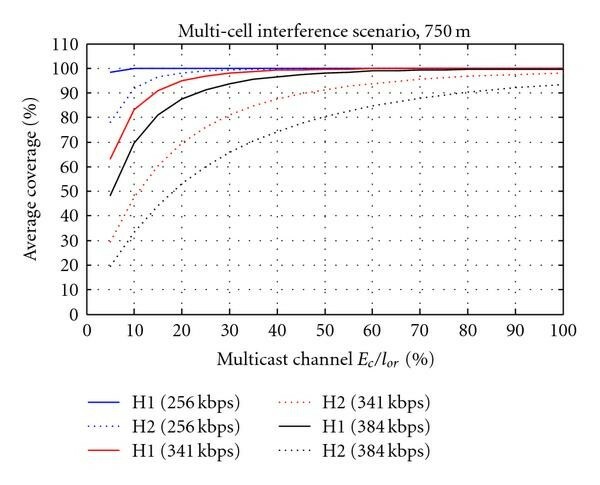 Apart from cell-edge users experiencing large intercell-interference, users with better channel conditions (closer to the base station) could receive the same service with a better quality (e.g., video resolution), as their receiving SNR would allow usage of a higher-rate MCS. Hierarchical modulation [5–8], which has been specified for broadcast systems like (Digital Video Broadcast Terrestrial) DVB-T or MediaFLO, is one way of accounting for unequal receiving conditions. Here, a signal constellation like 16QAM, with each symbol being represented by four bits, is interpreted in a sense that the two first bits belong to an underlying QPSK alphabet. This enables the use of two independent data streams with different sensitivity requirements. In the example above, the so-called high priority stream employs QPSK modulation and is designed to cover the whole service area. The low-priority stream requires the constellation to be demodulated as 16QAM, and provides an additional or refined service via the two additional bits. These may transport an additional MBMS channel with a different type of service, or an enhancement stream that, for example, leads to enhancing the resolution of the base stream. A design parameter that determines the constellation layout allows the control of the amount of distortion that the enhancements symbols add to the baseline constellation, and can be used to control the ratio of coverage areas or service data rates. Theoretical evaluation of this type of modulations where it is explicitly shown the dependence of the individual bit streams performance on the constellation design parameter has been previously presented in [9, 10]. Introducing multiresolution in a broadcast system mainly affects two parts, source coding and distribution/signalling. Until recently the source coding has been aimed toward achieving the highest compression ratio possible . With the development of cellular phones to competent multimedia terminals and integration of the cellular networks with the Internet, the result is a more heterogeneous network with regard to terminal capabilities and connection speed. In this work it is assumed that scalable source coders are used and scalability is done in layers. It consists of one basic layer to encode the basic quality and consecutive refinement or enhancement layers for higher quality. The source coder can generate a total of L layers. For simplicity it is also assumed that all layers require the same data rate and target bit error rate. Specifically for broadcast and multicast transmissions in a mobile cellular network, depending on the communication link conditions, some receivers will have better signal-to-noise ratios (SNR) than others and thus the capacity of the communication link for these users is higher. Hierarchical constellations and MIMO (spatial multiplexing [12, 13]) are methods to offer multiresolution. The authors of this paper have previously analyzed and evaluated these two forms of multiresolution considering the WCDMA technology in [14–16]. In OFDMA-based networks, the transmission of different fractions of the total set of subcarriers (chunks) depending on the position of the mobiles is another way to offer multiresolution. Any of these methods is able to provide unequal bit error protection. In any case there are two or more classes of bits with different error protection, to which different streams of information can be mapped. Regardless of the channel conditions, a given user always attempts to demodulate both the more protected bits and the other bits that carry the additional resolution. Depending on its position inside the cell more or less blocks with additional resolution will be correctly received by the mobile user. However, the basic quality will be always correctly received independently of the position of any user, within the 95% coverage target. For increasing distance between terminals and base station decreasing bit rates are correctly received due to the decrease of SNR. Adaptive Modulation and Coding (AMC) is a technique that maximizes the total throughput for unicast transmissions. The decrease of SNR with the distance is common to unicast or broadcast/multicast transmissions. However for broadcast/multicast the same video content is transmitted and AMC is not possible without personal uplink feedback. With the introduction of multiresolution techniques the maximization of the total throughput is the goal to achieve. System-level simulations for broadcast/multicast with multiresolution are necessary to evaluate the achievable throughput gain compare to single resolution systems. In this paper Section 2 refers to the objectives and requirements, in Section 3 the evaluation methodology and simulation assumptions are presented. In Section 4 the system level results are presented, and finally in Section 5 the summary and conclusions are presented. The introduction of hierarchical modulation in a broadcast cellular system requires a scalable video coded as shown in Figure 1 [11, 14], where the base layer transmission provides the minimum quality, and one or more enhancement layers offer improved quality at increasing bit/frame rates and resolutions. This method significantly decreases the storage costs of the content provider compared to the simulcast distribution where for a single video sequence excessive video sequences must be stored at the server to enable its distribution to different customers with different terminal capabilities. 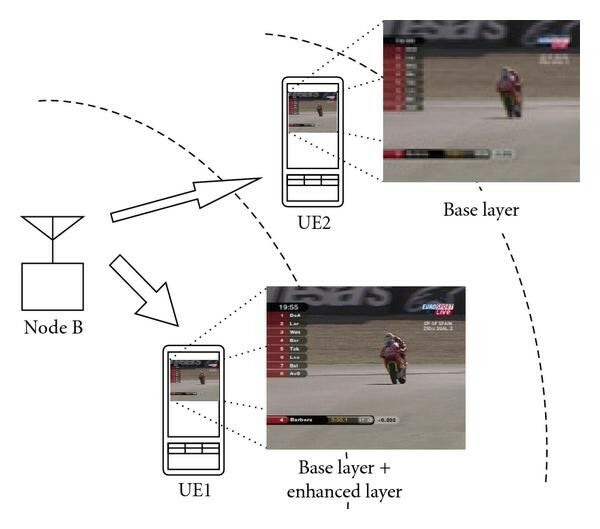 Besides being a potential solution for content adaptation, scalable video schemes may also allow an efficient usage of radio resources in enhanced MBMS. According to Release 6 of 3GPP the single resolution scheme corresponds to transmission of QPSK with more than 95% coverage. The assignment of the fraction of the total transmission power reserved for MBMS has implications in the coverage and average throughput of the multiresolution based on the hierarchical 16-QAM scheme. 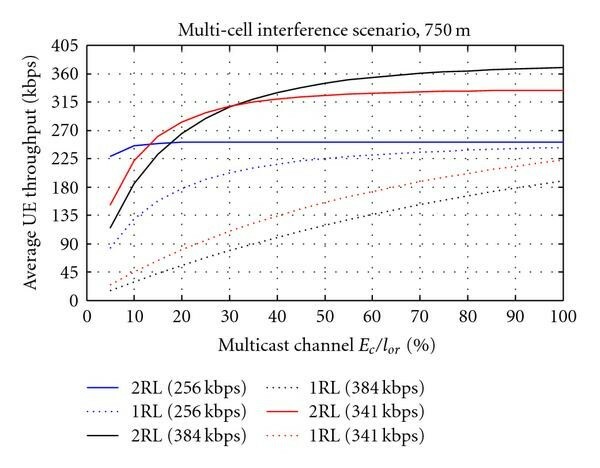 The multicell interference distribution has also strong impact in the coverage and throughput. An interesting design parameter is the channel bit rate (and its coding rate) associated to the multiresolution scheme. An optimization of this parameter has also strong impact in the achievable coverage and average throughputs. Regardless of the channel conditions and user location, a given user always attempts to demodulate both the base layer and the enhancement layer carrying additional resolution. For good multiresolution design, the basic information will be always correctly received independently of the position of any user, within the 95% coverage target. However, depending on its position inside the cell more or less blocks with additional resolution will be correctly received by the mobile user. The objective of this work is the design of multiresolution schemes in different scenarios, namely, multicell with intercell interference without and with macrodiversity support, and to measure the corresponding multiresolution gain of total throughput compared to the reference total throughput of the single resolution scheme based on the QPSK transmission. Typically, radio network simulations can be classified as either link level (radio link between the base station and the user terminal) or system level (several base stations with large number of mobile users). A single approach would be preferable, but the complexity of such simulator (including everything from transmitted waveforms to multicell network) is far too high for the required simulation resolutions and simulation time. Therefore, separate but interconnected link and system level approaches are needed. 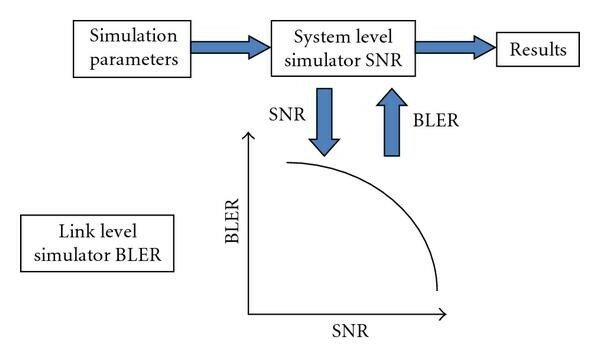 The link level simulator is needed for the system simulator to build a receiver model that can predict the receiver (Block Error Rate/Bit Error Rate) BLER/BER performance, taking into account channel estimation, interleaving, modulation, receiver structure, and decoding. The system level simulator is needed to model a system with a large number of mobiles and base stations, and algorithms operating in such a system. As the simulation is divided in two parts, an approach of linking between the two simulators must be defined. Conventionally, the information obtained from the link level simulator is inserted in the system level simulator through the utilization of a specific performance parameter (BLER) corresponding to a determined signal to interference plus noise ratio (SNR) estimated in the terminal or base station. In Figure 2 is shown the simulators interaction. Interaction between link level simulator and system level simulator. (ii)serve as a platform to the different multiresolution improvements tested and quantified. Typical time interval of each link level simulation is 0.5 seconds (as shown in Table 1). The entire OFDMA signal processing at the transmitter was included in the LLS as well as several different receiver structures. To achieve reliable channel estimation and data detection we employ a receiver capable of jointly performing these tasks through iterative processing. The structure of the iterative receiver is shown in Figure 3 (see also ). Link and system level simulation parameters for urban macrocellular scenario. The receiver structure for additive white Gaussian noise (AWGN) channel is less complex (only a few turbo-decoder iterations and no channel estimation nor channel equalization required). Multipath Rayleigh fading channels were considered in the simulator due to the sensitivity of hierarchical high-order QAM modulations to the channel parameters estimation. 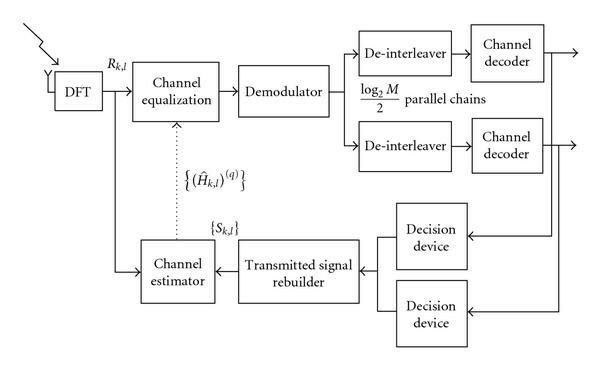 As indicated the receiver structure is nonlinear, iterative, and includes channel parameters estimation for the analyzed multipath Rayleigh fading channel . This explains why we used a different approach for the link level simulations compared to the typical 3GPP methodology which maps against coded AWGN curves for various transport formats. For the purpose of validating the work presented in this section, it was developed a system level simulator in Java, using a discrete event-based philosophy, which captures the dynamic behavior of the Radio Access Network System. This dynamic behavior includes the user (e.g., mobility and variable traffic demands), radio interface and (Radio Access Network) RAN with some level of abstraction. The system level simulator (SLS) works at Transmission Time Interval (TTI) rate and typical time interval of each simulation is 600 seconds. Table 1 shows the simulation parameters. It presents the parameters used in the link and system level simulations based on 3GPP documents [20–23]. The channel model used in the system level simulator considers three types of losses: distance loss, shadowing loss and multipath fading loss (one value per TTI). The model parameters depend on the environment. For the distance loss the Okumura-Hata Model from the COST 231 project was used (see ). Shadowing is due to the existence of large obstacles like buildings and the movement of UEs in and out of the shadows. This is modelled through a process with a lognormal distribution and a correlation distance. The multipath fading in the system level simulator corresponds to the 3GPP channel model, where the ITU Vehicular A (30 km/h) (see  Annex B) environment was chosen as reference. The latter model was also used in the link level simulator but at much higher rate. Vehicular A (with velocity km/h) channel model was chosen because it is an important test channel in 3GPP specifications also, it allows for direct comparison with previous system level simulations done by the authors . In OFDM systems the important parameter is the maximum delay of the multipath profile and its relation with the duration of the time guard between OFDM symbols to avoid intersymbol interference. 3GPP has specified a short time guard with about 4.75  s and a long one with 16.67  s. The long-time guard was considered in this paper, making the performance less sensitive to the chosen propagation channel. However, there is a reduction of the transmitted bit rates. In the radio access network subsystem system level simulator only the resulting fading loss of the channel model, expressed in dB, is taken into account. The fading model is provided by the link level simulator through a trace of average fading values (in dB), one per Transmission Time Interval (TTI) or Subframe duration. For each environment the mobile speed is the same and several traces of fading values are provided for each pair of antenna. A uniform distribution of mobile users is generated at the beginning of each simulation. Typical number of users chosen for each simulation run was 20 per sector. Each mobile has random mobility with the specified 30 km/h. Dynamic system level simulators like the one presented in this paper are very accurate, the main limitation is the hypothetical urban macrocellular test scenario that is different from any real one. Figure 4 illustrates the cellular layout (trisectorial antenna pattern) indicating the fractional frequency reuse of 1/3 considered in the system level simulations. 1/3 of the available bandwidth was used in each sector to reduce the multicell interference. 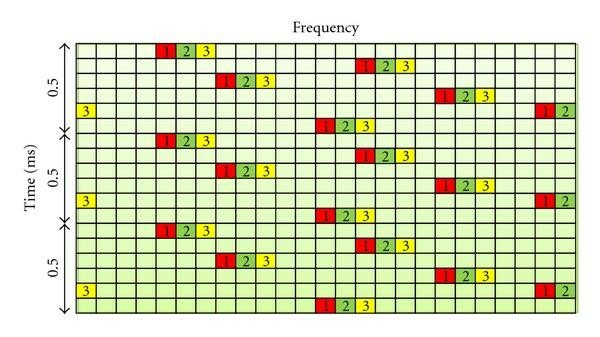 As indicated in Figure 4, the identification of the sources of multicell interference, that is, use of the same adjacent subcarriers (named physical resource blocks or chunks), is given by the sectors with the same colour/number, namely, red/one, green/two, or yellow/three. 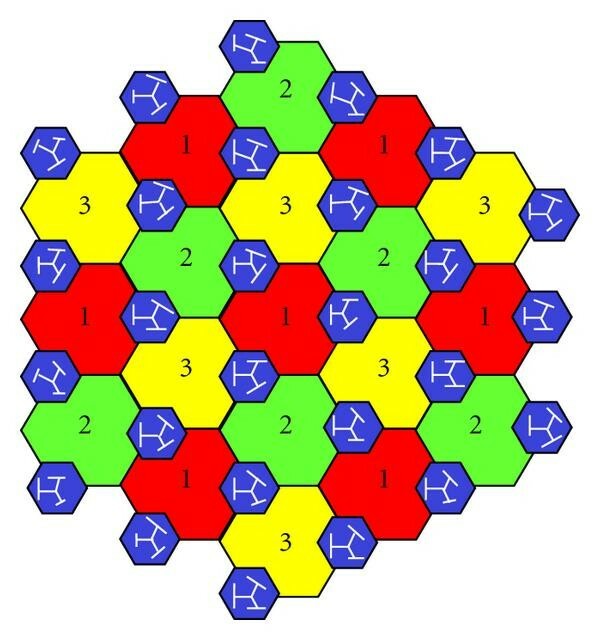 Cellular layout including the frequency reuse of 1/3 (colours/numbers of the cells). For 16-QAM hierarchical constellations two classes of bits with different error protection are used. The blue colour around the antennas only indicates the approximate coverage of the weak bits blocks, while the other colours indicate the coverage of the strong bits blocks. This is the case for the scenario to be analyzed with one radio link between the mobile and the closest base station. It is not assumed any time synchronism between the transmissions from different base stations with the same colour resulting in interference from all but one cell with the same colour. However, in the scenario with macrodiversity combining the two best radio links, it is assumed that there is time synchronization between the two closest base station sites with the same colour. In this case the multicell interference is reduced because only the other base station sites with the same colour remain unsynchronous and capable to interfere. Figure 5 illustrates the time and frequency division of the physical resource blocks (PRBs) considering that there are three sectors per cell. To combat the frequency selective fading adjacent PRBs should belong to different sectors as indicated in Figure 5. In each sector the total bandwidth should be available in 1/3 of each subslot of 0.5 ms, in addition, the allocation of the physical resource blocks by the sectors should be dynamic instead of fixed. For the system level simulation results presented in the paper what matters is the identification of the interfering PRBs. Fixed or variable positions of PRBs within the same Subframe, only matters if there is no coordination between adjacent base-stations to avoid intercell interference. We have assumed that this interference avoidance coordination exists. Variable positions of PRBs within one Subframe are better to combat fast fading effects due to multipath channels. Time and frequency division of the physical resource blocks. 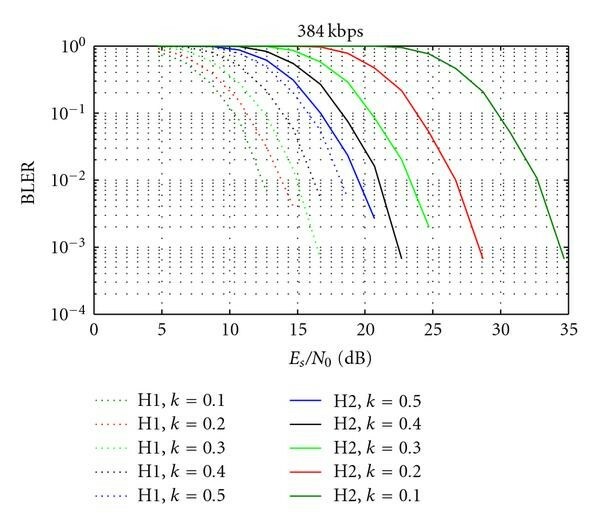 To study the behavior of the proposed OFDM multiresolution schemes, several simulations were performed for 16-QAM hierarchical modulations. 16-QAM hierarchical constellations are constructed using a main QPSK constellation where each symbol is in fact another QPSK constellation, as shown in Figure 6. Signal constellation for 16-QAM hierarchical modulation. Two classes of bits with different error protection were used. Each information stream was encoded with a block size of 2560 bits per Subframe duration of 0.5 ms. One third of the total physical resource blocks (PRB) are transmitted in each sector. This corresponds to an instantly occupied bandwidth of 3 MHz, where we have considered 20 PRBs each with 150 kHz of adjacent bandwidth (corresponding to 10 subcarriers with frequency spacing of 15 kHz). The number of adjacent subcarriers in each PRB was a study item in 3GPP by the time we started our simulation work. We have considered PRBs with 10 adjacent subcarriers instead of 12 as currently specified by 3GPP. However this change in the size of the PRBs does not change our simulation results for the propagation channels and velocity chosen. We have also chosen PRBs of this size to have an integer number of TV channels (i.e., PRBs) each with bit rate of 256 kbps for the chosen fractional frequency reuse of 1/3. Otherwise it would not be possible to compare directly the OFDM/OFDMA results with those obtained previously with the WCDMA technology. All the parameters used for OFDM during these simulations were based on 3GPP documents [20–23]. We have considered that three different coding rates are used, namely, 1/2, 2/3 and 3/4. This leads to total transmitted information bit rates per cell sector of 5120 kbps, 6825 kbps, and 7680 kbps, respectively. Considering that each PRB carries a different TV program channel this corresponds to channel bit rates of 256 kbps, 341 kbps and 384 kbps, respectively. We have evaluated in the link level simulations the hierarchical 16-QAM with different values of k for these three-channel bit rates. In Figures 7 and 8 we present the BLER versus for the channel bit rates 256 kbps and 384 kbps, respectively. BLER versus for hierarchical 16-QAM varying k , Rb = 256 kbps, VehA 30 km/h. BLER versus for hierarchical 16-QAM varying k , Rb = 384 kbps, VehA 30 km/h. In the legend H1 denotes the strong bits block and H2 the weak bits. 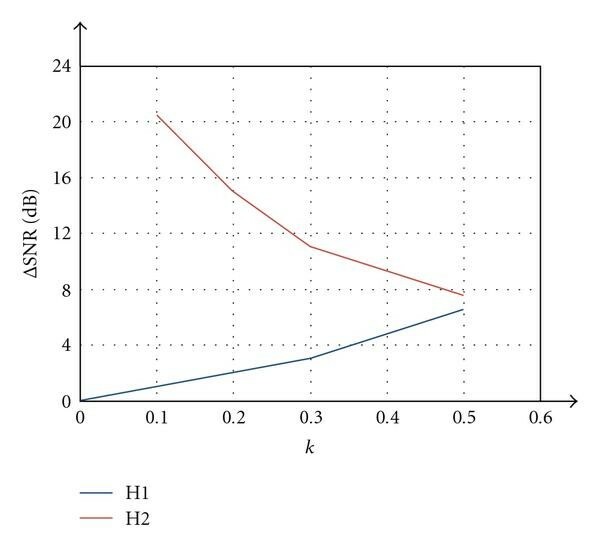 H1, corresponds to the most left curve requiring the minimum and H2, is the most right curve requiring the maximum . H1, and H2, correspond to the two inner curves that almost overlap (same ) in the two figures. corresponds to QPSK and its BLER performance is presented only in Figure 7. As expected, QPSK has a better coverage than any of the H1 blocks but obviously its bit rate is half of the set H1+H2 for each . Comparison between these two figures indicates that considering any BLER and in particular the reference BLER of 1%, higher channel bit rates require higher SNR) to offer any given BLER, resulting in less coverage. However, higher channel bit rates can provide higher maximum throughputs. For the coverage of the strong blocks is the maximum, however the coverage of the corresponding weak blocks is the minimum. As a result the resulting total throughput of both types of blocks is the smallest. Notice that corresponds to the 16QAM uniform constellation, where the strong bits are the standard bits of QPSK modulation, however their coverage is less than the QPSK. The coverage of the corresponding weak blocks ( ) is the maximum resulting in the highest total throughput of both types of blocks. For the reference BLER of 1%, the spread in values for different values is much higher for weak blocks compared to strong blocks. As a result, we observe a small coverage gain for smaller k values but associated to high loss of total throughput (strong weak blocks). This can be observed in Figure 9 where the difference, related to QPSK, in required SNR is presented versus k, taking the reference BLER of 1%. SNR versus k for hierarchical 16-QAM, 256 kbps, VehA 30 km/h. We have chosen the curves for the system level simulations because in this case there is the minimum difference between the BLER performance of H1 and H2, which is expected to assure the best combination of coverage and throughput. In the system level simulations mobile users receive strong and weak bits blocks transmitted from base stations. Each block undergoes small- and-large scale fading and multicell interference. In terms of coverage or throughput the SNR of each block is computed taking into account all the above impairments and based on the comparison between the reference SNR at a BLER of 1%, and the evaluated SNR it is decided whether the block is or not correctly received. This is done for all the transmitted blocks for all users in all sectors of the 19 cells, during typically 10 minutes. 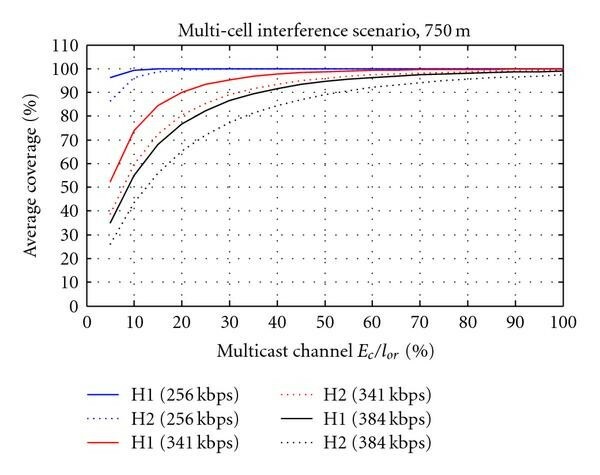 Figure 10 presents the coverage versus the fraction of the total transmitted power ( ), for the multicell interference scenario where there is interference only from 1/3 of the sectors due to the frequency reuse of 1/3 (see Figure 4). All interfering sites transmit with the maximum power of 80% according to the parameters indicated in Table 1. The cell radius is 750 m, and we have separated strong blocks (H1) from weak blocks (H2) without including macrodiversity combining. The multicell interference is 90% of the maximum transmitted power in each site. For = 50% and channel bit rate 256 kbps the coverage of H1 is 95% and for H2 is 85%. For the same , but 384 kbps data rate, the coverage values of H1 and H2 are 39% and 30%, respectively. In both cases there is a difference of about 10% between the coverage of H1 and H2 due to the chosen . Average coverage (%) versus , 1 Radio Link, . Figure 11 present the coverage versus separating strong blocks (H1) from weak blocks (H2) with macrodiversity combining of the best two radio links. For = 20% regardless of the channel bit rate and the type of blocks the coverage is always above 95%. However, for 384 kbps the coverage values of H1 and H2 are different from each other. Average coverage (%) versus , 2 Radio Links, . Only for = 50% the coverage of strong blocks is above or equal to 95% for 384 kbps, but for 256 kbps the coverage value for strong blocks is above 95% for = 5%. This indicates that as long as there is macrodiversity combining of the two best links it is possible to increase the channel bit rate or increase the number of transmitted channels keeping the same bit rate. 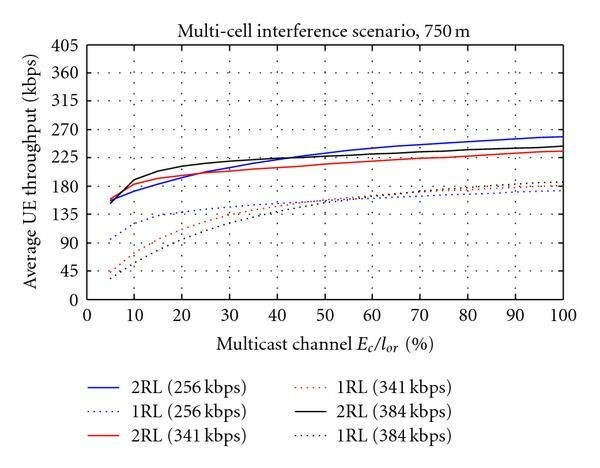 Figure 12 considers the throughput distribution as function of the for multicellular network with and without macrodiversity for the cell radius of 750 m. We observe a considerable gain in throughput when macrodiversity (2RL) is considered compared to the single radio link case. This is particularly true for the high bit rate 384 kbps. For the low bit rate the macrodiversity gain is not so substantial as the throughput performance is already good for a single radio link. Throughput versus , m, . 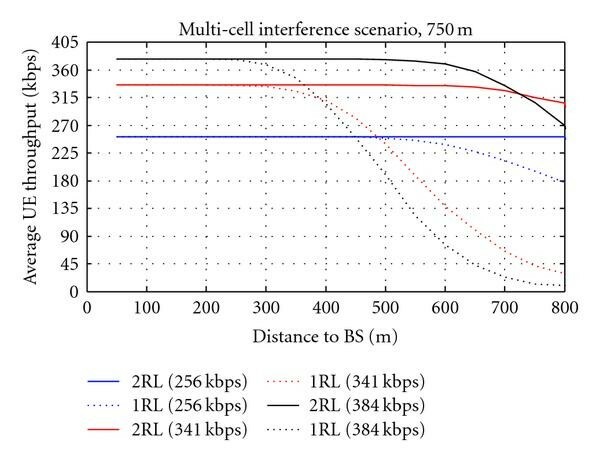 Figure 13 considers the throughput distribution as function of the distance between UEs and BS for the = 90%, with and without macrodiversity for the same cell radius of 750 m. For the chosen , macrodiversity (2RL) assure almost the maximum throughput for 256 kbps, however it is more obvious the decrease in throughput for 384 kbps and mobile users at the cell borders. It is obvious that without macrodiversity (1RL case), only for the 256 kbps channel, the throughput is almost the maximum regardless of the distance. For the high bit rate 384 kbps a single radio link only offers high throughput for users close to the base station. Throughput versus distance between UEs and BS, . 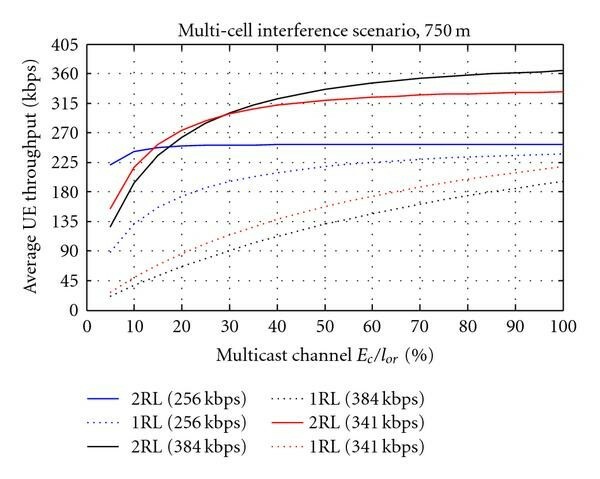 Based on these results for the 16QAM multiresolution scheme in the multicellular network with macrodiversity combining (compared to one radio link) it is possible to increase the channel bit rate keeping the same number of channels or increasing the number of channels keeping the same bit rate per channel. In terms of broadcasting mobile TV channels it might be important to increase the InterSite distanced to 1500 m to reduce the number of sites. In Figures 14 and 15 the coverage performance curves for and , versus , are presented and should be compared to the corresponding figure with , Figure 11. As expected the difference of coverage between H1 and H2 blocks increases with decreasing k, this is more noticeable for small k values such as where even with macrodiversity combining the coverage of H2 blocks is rather low. In Figures 16 and 17 the throughput performance versus , for and are presented and should be compared to Figure 12. With or without macrodiversity combining there is about the same throughput for and . However, there is a substantial decrease in throughput for without and especially with macrodiversity combining, independently of the channel bit rate. To get the 16QAM multiresolution gain compared to the single resolution with QPSK we should compute the aggregate throughput in all the cell area with multiresolution and divide by the single resolution aggregate throughput in the cell area. As the coverage of QPSK blocks is the same of strong bits blocks of hierarchical 16QAM due to macrodiversity combining the comparison of the aggregate throughput is based on the different coverage of the weak bits blocks. From Figures 12 and 16 it is clear that the smallest throughput gain is achieved for coding rate = 1/2 (256 kbps). For this case, the throughput gain is two, remember that the single resolution throughput of QPSK is 128 kbps. The highest throughput gain is achieved for coding rate = 3/4 (384 kbps). For this case, the throughput gain is almost three (for the throughput of 384 kbps is achieved up to 600 m far from the base station (BS) as shown in Figure 13). However for the throughput gain never reaches two (see Figure 17). So it is important to choose k values between [0.4,0.5] to achieve the highest multiresolution gain. We have studied and evaluated the use of QAM hierarchical constellations in an OFDM system as a multiresolution scheme for the enhanced MBMS network. Scenarios based on multicell networks without and with macrodiversity combining were evaluated using multiresolution based on 16QAM hierarchical modulation. We can conclude that multiresolution works fine with any of the analyzed scenarios, multicell networks without or with macrodiversity combining. Indeed it works better with multicell with macrodiversity than with multicell without macrodiversity. In multicell networks without macrodiversity due to the higher sensitivity to the channel bit rate of higher-order constellations we can increase the channel bit rate of each TV channel for users close to the base station. In multicell scenario with macrodiversity, the multiresolution schemes become less sensitive to the used channel bit rates. In multicell without macrodiversity to achieve higher multiresolution gain it is suggested to use the channel bit rate of 256 kbps, that is, the channel coding rate of 1/2. As long as there is previous recording of link quality information in the cell, it is recommended that a few different groups should be formed with different channel bit rates in order to increase the levels of multiresolution. One way to achieve this is the combination of hierarchical QAM modulations with MIMO . It was concluded that to achieve the highest multiresolution gain is important to choose k values between (0.4,0.5) and avoid smaller k values. For the high channel bit rate 384 kbps, the spectral efficiency achieved per cell sector considering that 20 TV channels are transmitted simultaneously in the total bandwidth of 10 MHz is 0.768 bps/Hz/cell. This value of spectral efficiency is valid for users at the cell border. The InterSite-distance (ISD) associated to this spectral efficiency is 1500 m. Alternatively, 30 TV channels with 256 kbps could be transmitted at the same time as indicated in Table 2. Capacity values for 16QAM hierarchical multiresolution OFDMA. Table 3 shows the capacity of MBMS single resolution taking into account results for the standard MBMS normalized in Release 6 and as presented in  for the same scenario with macrodiversity of two radio links. Capacity values for QPSK single resolution, CDMA scheme for 5 MHz bandwidth. The comparison between Tables 2 and 3 is not straightforward due to the difference of bandwidth and ISO. 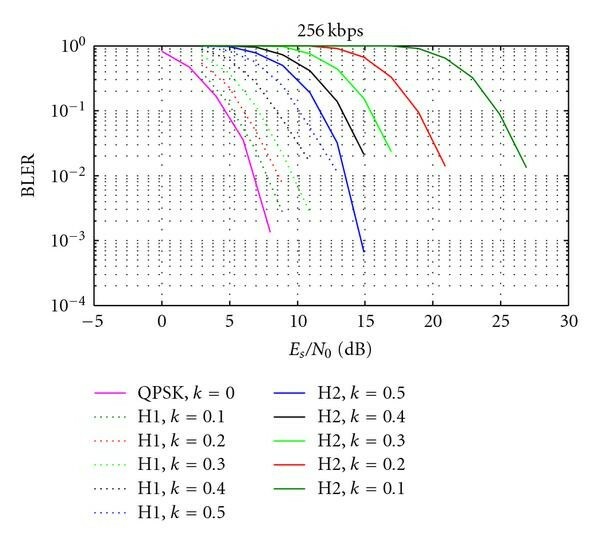 However it is possible to draw a capacity gain of at least two between hierarchical 16QAM and QPSK (notice that higher ISD is an advantage for broadcasting). In the future we will study and evaluate the use of 64QAM hierarchical constellations and MIMO (spatial multiplexing) in an OFDM/OFDMA system as other multiresolution schemes for the enhanced MBMS network. The scenario based on the use of single-frequency network (SFN) with the Multimedia Broadcast over SFN (MBSFN) channel will be also evaluated for 16QAM hierarchical modulation and compared with the present work.